ALICE KUMABEH-DOMINGO CARRIES FORTY YEARS OF EXPERIENCE IN THE FIELD OF DEVELOPMENT WORK WITH AN IMPRESSIVE RECORD OF PROJECTS TO HER NAME. NOW, SHE IS POISED TO BE THE NEXT WOMAN PARLIAMENTARIAN FROM BONTHE DISTRICT. Alice Kumabeh-Domingo was born and bred in Mattru Jong. Her entire life has evolved around the township and the Bonthe District, except for brief educational stints in other cities. She is a product of the UBC Primary School and the Centennial Secondary School in Mattru Jong. She is a certified State Enrolled Nurse with over forty years of experience, and most of her service has been in Mattru Jong and outlaying Chiefdoms in the Bonthe District. In 1986, Alice Kumabeh-Domingo enrolled for training as a Nursing Aid at the UBC Hospital in Mattru Jong. She worked at the Hospital for four years before enrolling at the Serabu Hospital where she acquired her State Enrolled Nurse certificate. Alice returned to work at the UBC Hospital until 1995 when the rebels ran them out. For the next two years, the town was under rebel occupation. Alice returned to Mattru Jong in 1997 after the rebels were routed out by loyal government forces and she has never looked back. Alice Kumabeh-Domingo has an indisputable commitment and loyalty to Mattru Jong and the Bonthe District. The people of the District are aware of her dedication and would prefer that she represents them in Parliament. Alice is running on her record. Her people know that she will defend. She has always been defending them with her unique set of community development skills which, she will bring to her new job as a Parliamentarian. Alice is looking forward to sitting down as an active Law Maker. Her stint in the field of community development jobs prepares her for this moment because Alice Kumabeh-Domingo is development-oriented and has been in the field of development for over 20 years. Besides, she is also a result-oriented activist, which is why she is running – on her record! Strengthening parliament through more women participation enables the law-making body to have enlightening perspectives from various demographics. The voice of women is essential in mapping out the next development route for Sierra Leone. Men and women must work together to ensure that the nation profits from the contribution of all facets of our society. Alice has the experience to lead Constituency 93 and to represent them in Parliament. A woman of stature, she will serve both a marginal group people and community. Accomplishing the primary phase of her campaign means she has to win the primaries and then the elections. Alice will need your help. Go to the communities – wherever you find the Red Cross emblem – in Jong and Imperi Chiefdoms, it is the work of Alice Kumabeh-Domingo. When it comes to being productive, protective, preventive and redemptive, you can count on Alice Kumabeh. Working in the NGO for 19 years, I am going to use all the experiences that I have acquired in program planning – as well as in political and local approaches – to transform my constituency,” she assures her constituents. WHY PARLIAMENT AND WHAT WILL ALICE KUMABEH-DOMINGO DO IN PARLIAMENT? A Parliamentarian serves as mouthpiece and Servant of their people, and Alice has always been the Servant of the Mattru Jong community. Alice sees her primary role as a member of the Law Making body to work and “seek the best interest of our people.” She will come to the job prepared to play an oversight role for Line Ministries and MOHS and Council which is the development wing of the District. Alice Kumabeh-Domingo first decided to run for the Parliamentary seat of Constituency 93 in 2012. She lost that contest to the current Parliamentarian, Honorable Brima Conteh in a runoff contest. Without an iota of disillusionment, she stayed highly involved in the 2012 campaigns and even championed the Campaign of his opponent to victory. “The victory of the Party in Bonthe District is my greatest concern and, we have succeeded in driving out the KKY Movement from the District.” As a Party activist and leader, Alice has participated in two National Conventions, first in 2013 and 2017. 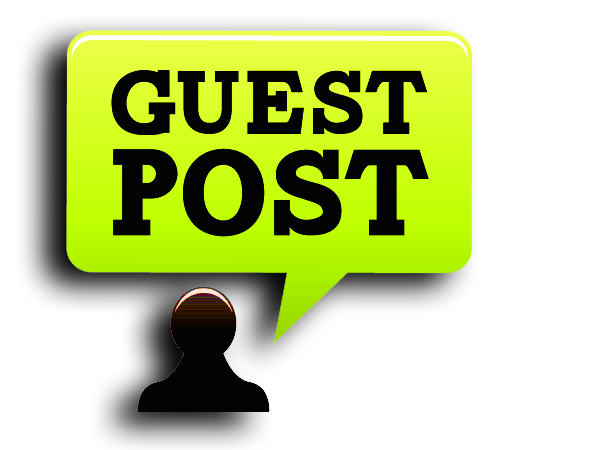 From 2005 to 2007, SLPP faced an internal crisis after the Makeni convention that saw former Vice President, Solomon Ekuma Berewa become the SLPP Flagbearer for the 2007 elections. 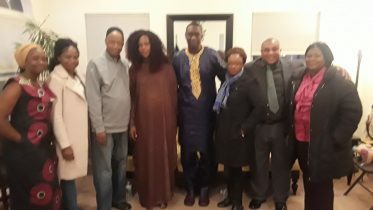 The crisis came to a head when Charles Margai decided to quit the SLPP and form the Positive Movement for Democratic Change (PMDC). Nowhere was the PMDC impact more visible than the Bonthe District where PMDC took all the parliamentary seats, dealing a massive blow to the SLPP in its stronghold. Recently, the KKY Movement wanted to create a foothold in the District without success. 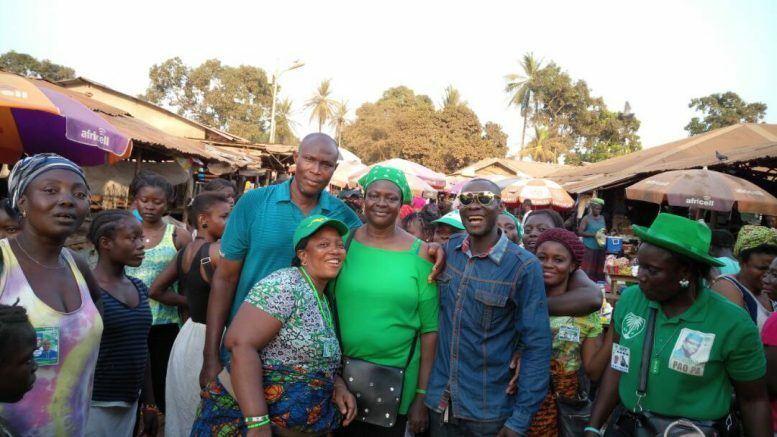 It is against this background that one should start to evaluate the work of Alice Kumabeh, a key leader in mobilizing the District into the SLPP orbit. She did this by first working to get those that have affiliated with PMDC to return to the SLPP and encourage those that have joined the APC also to return. Through these efforts, she has served Constituency 79 which is now 92 as Chairman from 2013 to 2017. During this period, she has helped to restructure the Party in the Constituency and revived the Elders Council. This Council is very supportive of her efforts, and she relies on their knowledge and experience to work with the Party members to create a stable sense of commitment to the SLPP. Alice Kumabeh is a role model. She comes with a forty-year experience as a Nurse and Community Activist. Alice has lived all her life in Mattru Jong except for brief periods during the war and, to seek further educational opportunities. While most of her contemporary Nurses chose to stay in bigger cities, Alice returned to Mattru Jong to serve her people. She helps young girls with a scholarship. She also helps women’s groups at Chiefdom levels –Jong, Imperi, Sogbeni, Kpanda Kemoh with funds to start a business and generate sustainable income. Alice can point with gratitude and humility to several community initiatives during her forty years career as a Nurse and Community Activist – titles that have earned her credibility and built into an enduring community leader with clear focus and vision for Mattru Jong and the entire Bonthe District. Against this background rests the qualities and reasons for her national aspirations to represent her community in Parliament. Among Alice’s several community initiatives is the formation of the Rural Women Empowerment Association, an organization that brings women together and support them with capacity-building projects such as workshops and writing projects for them. Alice also established the Forum for African Women Educationist (FAWE) primary school in Mattru Jong 2002. As a volunteer for the International NGO, World Vision, Alice served as Chairman of the Development Management Committee for eight years. During those years, she facilitated the construction of schools, clinics, and community stores with a lot of community events. From 2004 to 2012, Alice served on the World Vision Liaison committee. In addition to the mentioned roles, Alice was the Bonthe District focal person for the Special Court for Sierra Leone. Her responsibilities entail facilitating, conflict mapping and community sensitization projects. The wars years, 1991 – 2002 brought lots of destruction, especially in rural communities across Sierra Leone. Bonthe District was no exception. It would require a massive influx of development opportunities to stabilize the populations and refocus their citizens to assuming responsibilities to rebuild their lives. Local and international NGO have to find a way to reach their beneficiaries and all tools, including communications tools, will be required to accomplish this feat. Radio will be a significant part of this new community mobilization approach. Radio amplifies the voices of marginal people in communities. It is an essential tool to share ideas and knowledge and to empower individuals and communities to take actions and improve their lives. Alice Kumabeh-Domingo exudes a quiet strength with broad knowledge and, understanding of development issues. With a group of other women, they set up what is now Radio Voice of Women in Mattru Jong. Alice was one of the active advocates for a radio station in the Bonthe District. Sarah Rogers was head of the team. Alice came after and in succession, Adama Ansumana, Mariama Fendewo and Janet Massaquoi. These women produced their first cassette but struggled to name their newest venture. Credit for the name, Radio Voice of Women goes to Adama Ansumana. The name became an immediate hit with the women, and today, Radio Voice of Women is a significant development partner in the Bonthe District. The pioneers and founding partners of Radio Voice of Women understand the people of Bonthe District. Their knowledge of Bonthe District is second to none. The beliefs and values of the District are inherently ingrained in them. They represent an informed and knowledgeable fabric in the social and cultural norms that shape the lives of people in the District. Through the radio effort, Alice and her partners have been engaging the community and listening to adults and children as they identify problems, propose solutions and act upon them. With the power of communication, Radio Voice of Women is now at the forefront of promoting all aspects of development in the community. The radio was one means to efficiently contain the spread of Ebola in the township of Mattru Jong and, in the Bonthe District. Added to all her other commitments in the community, Alice Kumabeh-Domingo still finds time to serve her community as a Board Member of several institutions. She is a National Board Member of the Sierra Leone Opportunities Industrialization Centers (SLOIC-MJTC) as well as chairperson of its Management Committee. Alice Kumabeh-Domingo is a product of the UBC Mission schools in Mattru Jong. She is an alumnus of Centennial Secondary School. Her training as a Nurse started at the UBC Hospital Nursing Training School. Today, she is a Board Member of Centennial Secondary School and, Chairperson of the CENTENNIAL INFRASTRUCTURAL BOARD (CIB) and responsible for resuscitating the infrastructural development of CSS in partnership with Engineers Without Borders (EWB) and Rotary Club. Alice Kumabeh-Domingo is also the Steering Committee Chairman of the UBC Hospital, a Resident Board Member of the Mattru Community Bank. Across the river in Sierra Rutile, Alice serves as a Board Member for Jackson and Davon Andersen Institute. Alice Kumabeh-Domingo has worked for the Red Cross Society of Sierra Leone for 19 years. She is the budget holder and Field Health Officer responsible to Jong and Imperi Chiefdoms. She is responsible for delivering all the developments assigned to communities in consultation with authorities and partners in these Chiefdoms. The highlight of her profession was in 2014 when she was appointed to be the Manager for Bonthe District. She was fortunate in handling the Ebola response activities until July 11, 2015. In her continued effort in the areas of preventive health, Alice facilitated the construction and rehabilitation of latrines and water wells. With the facilitation of seed banks, providing seeds, funds, and tools to mothers clubs for Income Generating Activity (IGA) and Emergency Obstetric Care (EOC) for women. Alice enhanced the capacities of women to be self-reliant in the local communities. Without the advocacy work of Alice Kumabeh, the SLRCS was going to close in Mattru Jong. But her work yielded a result. She secured an office, water well, latrine and staff quarters for the local Red Cross Society and today, that effort is another testament to her excellent community service. Send more qualified women to parliament. The Alice Kumabeh for Constituency 92 Member Of Parliament campaign is receiving donations to help with the primaries as well as the elections. You can be a part of the campaign’s success. To help, please email Alice Kumabeh-Domingo at akumabeh@gmail.com. Best way to reach Alice Kumabeh is to call her in Sierra Leone at +232-76-314-221. 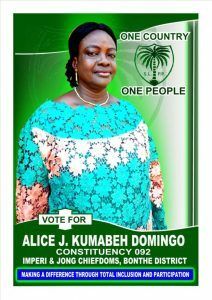 Be the first to comment on "Alice Kumabeh-Domingo Will Represent Bonthe District In Parliament"